Size: 9.1" x 6.5" x 2.6"
Look carefully at the display of the SR-22 and you'll notice immediately that this calculator could perform amazing calculations. It is the only calculator reported so far to perform Octal-Decimal-Hexadecimal conversions on the base of floating point numbers. Later calculators like the TI Programmer work only on integer numbers. 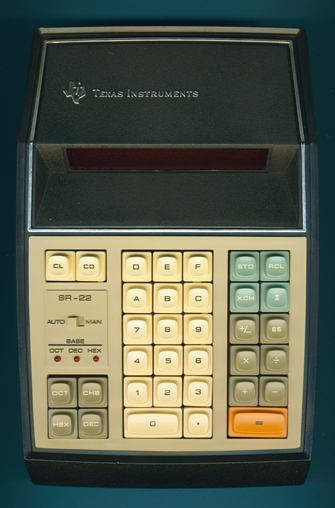 The SR-22 is one of the few scientific desktop calculators manufactured by Texas Instruments. It uses a housing with the size of a TI-3500 but the extreme wedge shape of the SR-10. • The Panaplex II display manufactured by Burroughs. • The keyboard assembly with the keys, slider switch and discrete LED's. • Upper part Discrete high-voltage drivers for the Panaplex II display. The calculating circuit is formed by an impressive trio of 40-pin Integrated Circuits based on the TMS0201 chip-set introduced in 1973 for calculators like the TI-4000 and TI-450. Most of the known designs use only two chips, a TMS02xx Data-Processor and a TMS03xx ROM-Chip. Only the SR-22 and the TI-620 are reported so far to sport a second ROM-Chip labelled TMS04xx. The same housing was used with the simpler SR-20 calculator, while the huge power supply AC9222 was exclusively designed for the SR-22. Read more about George Boole, the inventor of the Boolean algebra.